They were the most depressing group of people Yossarian had ever been with. They were always in high spirits. They laughed at everything. They called him “Yo-Yo” jocularly and came in tipsy late at night and woke him with their clumsy, bumping, giggling efforts to be quiet, them bombarded him with asinine shouts of hilarious good-fellowship when he sat up cursing to complain. He wanted to massacre them each time they did. They reminded him of Donald Duck’s nephews. They were afraid of Yossarian and persecuted him incessantly with nagging generosity and with their exasperating insistence on doing small favours for him. They were reckless, puerile, congenial, naïve, presumptuous, deferential and rambunctious. They were dumb. They had no complaints. They admired Colonel Cathcart and they found Colonel Korn witty. They were afraid of Yossarian, but they were not in the least bit afraid of Colonel Cathcart’s seventy missions. 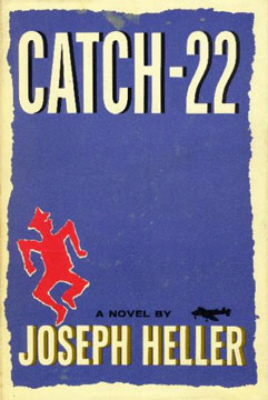 They were four clean-cut kids who were having lots of fun, and they were driving Yossarian nuts. He could not make them understand that he was a crotchety old fogey of twenty-eight, that he belonged to another generation, another era, another world, that having a good time bored him and was not worth the effort, and they bored him, too. He could not make them shut up; they were worse than women. They had not brains enough to be introverted and depressed.